From Nature specialises in handmade vegan food, with many of our ingredients sourced in our home county of Somerset. Our food is free of all animal products, which means those with lactose or egg intolerances and allergies can also safely eat our foods. If you’re vegan and you miss the tangy taste of cheese, the From Nature’s cultured cashew cheese selection is one of our top sellers, including sharp cheddar, smokey cheddar and goats cheese. 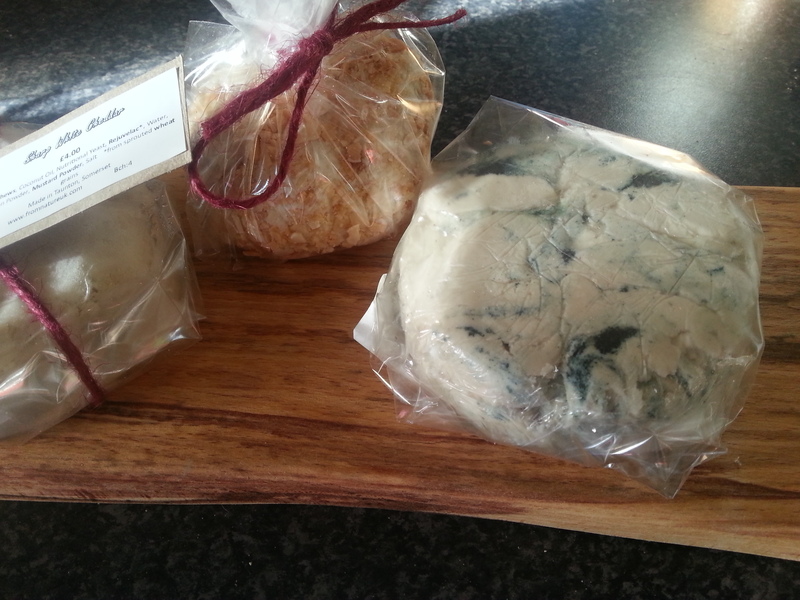 We have recently introduced an aged stilton which uses the same mould found on dairy stilton. We also offer a ready-to-eat selection of pasties and cakes to those who follow a cruelty-free diet. You can find From Nature at Taunton Farmers’ Market every Thursday, where we’ve had a stall since we began business in 2015. This award-winning market recently won Gold for the fifth year in ‘Taste of the West’ Farmers Market Category. Held every Thursday in the town’s High Street, Taunton Farmers’ Market is a thriving centre of good locally-produced food. The vegan lifestyle has recently had an upsurge in interest, and as an exciting result several vegan markets have started up in the area, running monthly. We’re delighted to be part of the vegan markets at Frome, Bridport and Exeter, where we sell our delicious cheeses, along with our other vegan products. You can find where we’ll be next on our calendar section. You can also order our cheeses online. Hi! Bought your Mistrami, chorizo, “goats cheese” and “brie” on Thurs and I absolutely loved every piece of it. All so wonderful. Is it possible to order items and pay & pick up on the nearest Thursday at the market in Taunton? Hello. I’m sorry I didn’t reply to this. I thought my website was set to alert me for any messages, but obviously not :(. I’m so glad you liked my products. Yes, you can order items and I will hold them back in my cold box for you to collect on a Thursday and you can pay at the time. I just need a day or so notice, but given that I don’t always remember to check my website for messages, it might be safer to email me at fromnatureuk@hotmail.com. I will send my reply to your email address, too, just in case this message doesn’t automatically come through to you. Recently bought the Cashew Stilton. I have just 3 words. Wow. Wow. Wow. My vegan son has just treated me to a tiny bit of your vegan blue cheese bought yesterday in Frome; very nice! Cheese and eggs are my addiction but this might help me to overcome it!